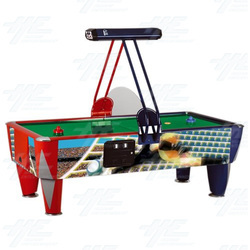 SAM air hockey tables are known for their quality and durability. The Fast Track Air Hockey comes with a mirrored steel playfield, lively score commentary, an angled puck for safer gameplay and an added safety screen for bonus protection. The 8 foot air hockey table comes with 6 goal keeps/bats and fast, medium and slow pucks.